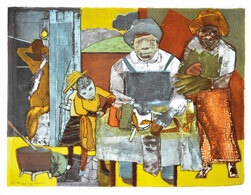 Romare Bearden was an African American artist and writer. Born in Charlotte, North Carolina, he moved to New York City at a young age. His started his art career creating scenes about the American South. 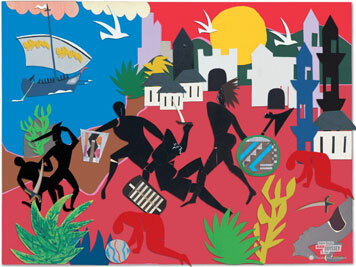 Bearden grew as an artist through his life experiences. His style of the American South was strongly influenced by Mexican muralists like Diego Rivera, and Jose Clemente Orozco. He attempted to express his feelings about the world after his experience in the US Army during WWII. In 1950, he returned to Paris and began studying Art History and Philosophy. This changed his style of art as he began to produce abstract representations of what he considered as human. 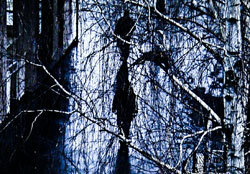 His work was put in the Samuel M. Kootz gallery until his work was considered to be not abstract enough. One of his paintings, the “Golgotha”, was an abstract representation of the Crucifixion. He tried to emulate the emotions and actions of the crowds gathered around the Crucifixion. According to himself, Christ’s life, death, and resurrection are the greatest expressions of man’s humanism.